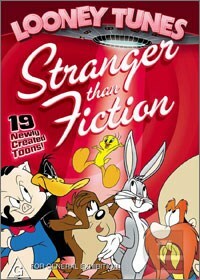 Looney Tunes: Stranger Than Fiction is a collection of all new science fiction themed animated shorts featuring the Warner Bros Looney Tunes stable of characters. Daffy Duck acts as host of the television show “Mysterious Phenomena of the Unexplained” introducing us to each short – parodies of film, television and well known supernatural myths. The shorts range from the banal to the bad – was the world crying out to see a zombie army of Tweety Birds or Marvin the Martian hosting a Who Wants to Be a Millionaire knockoff? No, they were not and I’ll be brutally honest, I turned the DVD off after 30 minutes; I couldn’t stand to watch anymore. The animation is competent but essentially third rate, direct to DVD animation and not in keeping with the spirit and legacy of the original Warner Bros cartoons. There is no artistry or skill on show, there is no manic edge to the animation or stories - they are dead and lifeless. Chuck Jones would surely be rolling in his grave. I will give credit to the character voice over artists, whilst no one can replace Mel Blanc they do a damn fine job recreating Daffy, Bugs and co, it is just a shame their talents are wasted here. Looney Tunes: Stranger Than Fiction would bore even the most easy to please child and they will hardly enamour the characters to a new generation. If Warner Bros. had any nous they would simply release the Golden Collection DVDs, which featured the original Looney Tunes cartoons, onto the Australian market (though they did release a similar product it was not of the same standard as the American release – complete with audio commentaries and documentaries). Any Looney Tunes fan should steer well clear of this offering.